This Florence to Venice sightseeing transfer leaves you in Venice while including plenty of time to take in the beauty of Verona during a 3-hour stopover. 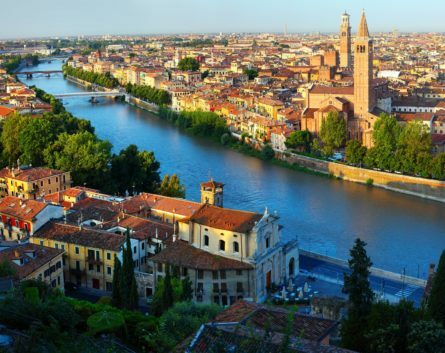 After picking you up from your accommodations in Florence, our expert driver will transfer you to the picturesque town of Verona. Built along the Adige River, it’s the famous setting of Shakespeare’s classic Romeo and Juliet, and it is home to the spectacular Opera, performed every year in the Roman open-air amphitheater. Wander the twisting streets with a guide or at your leisure until you pass by Juliet’s balcony, and then continue on to stroll through the Piazza Erbe or explore the 30 AD Arena. After an unforgettable Veronese lunch, perhaps at the famous ’12 Apostoli’restaurant, finish the day with a visit to an esteemed winery, just outside of Verona, to tastethe local Valpolicella wine. Your driver will then transfer you to Venice, where the rest of your journey awaits.